Exhibit shared or complementary characteristics of the group they want to belong to. 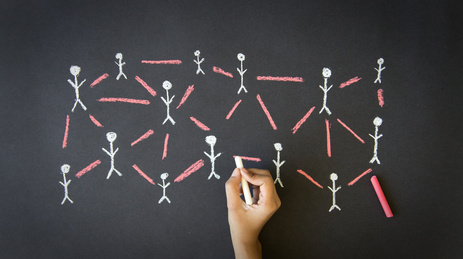 Connectedness is related to participation in organisations, society, as well as social networks. Individuals that experience high connectedness are generally better equip to use cognitive processes such as self-evaluation and self-comparison in order to manage themselves. Connectedness is therefore a vital attribute to constructive interpersonal functioning as the effects of low connectedness may include self-estrangement, loneliness, depression and a loss of meaning. Organisations, in very broad terms, will have two groups of individuals: there will the group of collectivists – the people who prioritise and value relationality, and then there will be the individualists – the people who prioritise and value expertise and competence. These preferences can influence a person’s responsiveness to a specific management or leadership style. Literature also suggests that low group connectedness in the workplace increases resistance to authority. Keep on having regular team meetings, discussions and conversations, and keep on bringing the focus back to: why you are a team, why you need each other, and what you expect and need form each other in order to be a high performance team.